Venini is arguably the best known manufacturer of fine Italian art glass and lighting, founded in 1921 in the Italian glass making capital of Murano-- in truth an island in the waters surrounding Venice. 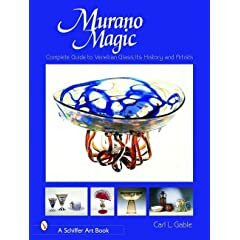 In 1291, the island of Murano was declared an industrial area by the local ruler, and it soon became a major center of glass design and production. Venini is still active to this day producing high quality lighting and decorative objects for both individual collectors and major commercial projects. The Venini name is synonomous with great design, having worked with many major artists over the years including Gio Ponti, Carlo Scarpa, Ettore Sottsass, Fulvio Bianconi, and many others. At its inception in 1921, Giacomo Cappellin and Paolo Venini, who was only 26 at the time, founded the company, each with a rich family history in the worlds of art, antiques, and glassmaking. Known originally as Cappellin Venini, the company hired the Italian painter Vittorio Zecchin to be its first art director in what proved to be the first of many wise moves made to quickly establish a reputation for excellence. They used major national and international expositions to introduce their wares to a worldwide audience and created an export market paying premium prices for Italian art glass artistry. The company split in 1925, and modern day Venini was incorporated with new artistic director and sculptor Napoleone Martinuzzi. A lawyer by background, Paolo Venini had studied the techniques of the artistic directors and artisans since the early days, and by the early 1930s he took an increasingly visible role in the company's artistic direction. 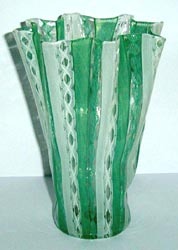 Early Venini glass reflects the "streamlined" Art Deco style which they helped to popularize, but Venini was known as a good place for artists to collaborate with Venetian glass artisans, free to pursue their own unique visions in glass with the help of Venini. 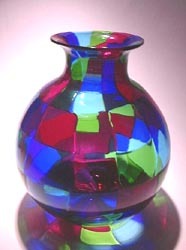 Venini actively explored new glassmaking techniques, leading the Italian avant garde in moving beyond classic Murano glass blowing. In the 1950s, Venini was a pioneer introdicing what today is known as mid-century modern design, especially lighting using glass in the colors of fifties modern. Venini designs are straightforward, clean, and simple, making a design statement with simple shapes and striking colors. Paolo Venini died in 1959, but his artistic tradition and his collaboration with talented artists of the time continues today in Murano. Buy period Venini, Murano, and other finer art glass on the Collectics Glass & Crystal and Fine Antiques pages, or search the entire site for great antiques, collectibles, and crafts for every collector!